What is direct link monetization? Most of the time monetizing a website involves pasting a piece of code into an area of your page where you want an ad to appear. The code contains information that is communicated to an ad server, that then sends an appropriate image into that location. If a user clicks on the ad, they get sent to the appropriate landing page. What if you do have a website, but the provided creatives don’t work well with your site’s layout or style? A direct link is, as the name implies, just a link. It still leverages the same ad optimization technology that sits at the heart of the Adcash platform, but it just skips out the “creative selection” element as it doesn’t display an ad banner. When a user clicks on the link, whether it’s within some text or behind a creative that you have made yourself, the Adcash ad server automatically selects the best campaign landing page for them to reach, so you’re always making as much money as possible. As a publisher, you’re free to place that link virtually anywhere you want, allowing you to monetize almost any kind of traffic you can possibly imagine; social media, comment sections, forums, free file hosting sites. In order to really make the most of direct links on your website, you need to get the best click-through rate. How you go about this is very much up to you and can vary depending on the type of site you have or the traffic you want to monetize, but here are a few ideas you may be able to put into action on your own site. If you have a site that contains software downloads, videos or other similar types of content, you can add your direct link to that button, so that when a visitor clicks on it the site-under ad opens behind the page as they are taken to the download/page. You can also use the direct link to make ads appear on “interstitial” pages – pages that appear as the user makes their way from one page to another. The same principle also applies to lightboxes and full-screen ads. Creating a direct link monetization URL on the Adcash publisher platform is super simple. 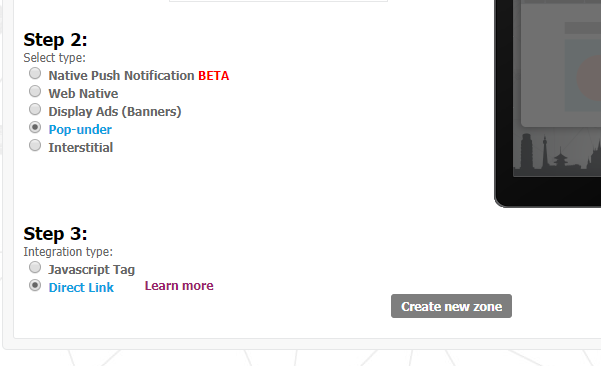 After logging in to your Adcash publisher account, select the Zones tab, then click "Create new zone". First, select a site from the list (the link you create doesn’t need to be used on that site though). Then select the pop-under ad format. Finally, select the direct link option. The system will then create a Direct URL for you. You can also choose between http or https, depending on your needs or personal preference. If you want to make changes after you’ve set up your direct link, you can find it in your Zones list. What kind of traffic can I send? We don’t allow bot or refresh traffic, content with violence or racism. For a full list of what traffic is approved, or otherwise, please check out our terms and conditions, right here. If you have any doubts, please contact our support team or your direct manager.